This #ThrowbackThursday photo is from 2013. 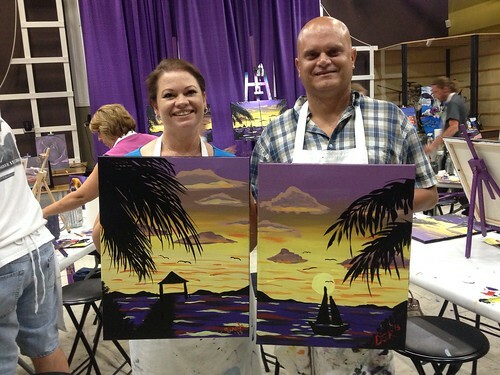 My wife suggested we go on a date to the Purple Easel. It’s a cool place where you can really kick back and enjoy yourself while sipping on a favorite beverage of your choice. After almost 13 years of marriage I can tell you it’s so great to get out on a date away from the kids on a regular basis, especially over the Summer. That’s my biggest survival tip for the Summer or anytime year round for that matter. In the photos you see the ocean which is a symbol for peace. We felt so peaceful together following the guide’s instructions and coming up with our very beautiful art. I have to admit I wasn’t sure I could do it but it actually worked out. We’re really proud of how they came out. The ocean has always been a symbol of peace for me. I get very relaxed when I go to the beach. That made this date that much more enjoyable. Another point on the topic of relationships is to do this simple thing: plan something. I have found my wife reacts very favorably when I plan the smallest of things. It shows I took time away from my schedule to plan something for her. I’m thinking of my wife’s smile as a “grand slam” and planning things to keep our marriage new and fresh is a sure fire way to get there. Just look at us both smiling in the photo. She actually planned this date but I’m planning really fun things as the Summer winds down toward August 10th when we go back.